Our lives and the lives of future generations depend on it. 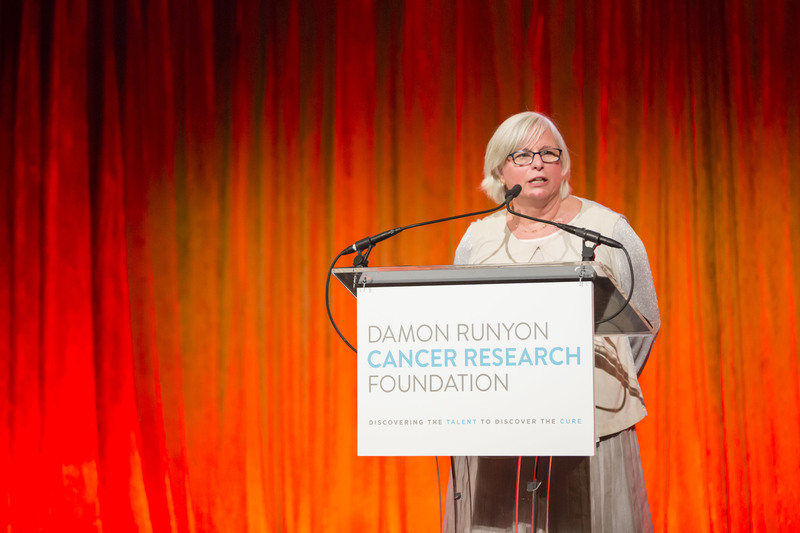 Lorraine Egan, President and CEO of Damon Runyon Cancer Research Foundation, addresses scientists and supporters at the foundation’s Annual Breakfast at Cipriani 42nd Street in New York City on June 6, 2017. Today is World Cancer Day. A day to reflect on the good news about progress against cancer and the challenges that lie ahead. The good news is that, thanks to cancer research being conducted across the globe, real progress is being made in cancer prevention, early diagnosis and treatment. Cancer deaths in the U.S. have dropped 26% from 1991 to 2015, saving nearly 3 million lives. The pace of development of new therapies is accelerating rapidly thanks to new understanding of what causes and drives cancers. The challenge is that the world cancer burden is expanding rapidly due to the growth and aging of the population. According to the International Agency for Research on Cancer, by 2035 there will be nearly 24 million new cancer cases annually and more than 14 million cancer deaths. In the technology world, we understand the power of young innovators to change our lives – think Apple, Microsoft, Google and Facebook. The same is true in biomedical research, where most Nobel Laurates made their discoveries before age 40. While there is nearly universal agreement about the importance of young talent in biomedical research, their numbers are shrinking. A study published last year showed that scientists below age 46 are increasingly less likely to be funded by the federal government, the primary source of academic research dollars in the U.S., while scientists over age 55 are receiving a much larger share of the available dollars. Ironically, this shift is largely the result of progress in biomedical research, which helped increase the average lifespan in the U.S. by more than 30 years over the 20th Century, leading to longer careers for all of us, scientists included. However, the imbalance is also causing a brain drain, where fewer young people are choosing academic research careers due to the overly competitive funding situation. As an organization that funds top young cancer researchers, we have seen a recent drop in applicants for our prestigious and highly coveted training grants and have heard many stories about talented young people leaving science because their chances of being funded are so poor. The National Institutes of Health is very aware of this dire situation and has tried a number of initiatives to increase the number of early career scientists, without success. It is up to Congress to recommit our country to its leadership role in finding new cures for cancer and all human diseases through a significantly increased and sustained commitment to biomedical research. None of us can take for granted that scientific breakthroughs will continue to happen. Each of us has a stake in our nation’s investment in scientific research. Our lives and the lives of future generations depend on it. Ms. Egan is President and Chief Executive Officer of the Damon Runyon Cancer Research Foundation. Recognized for its highly prestigious programs, the Foundation supports young scientists conducting innovative cancer research at leading medical centers and research institutions across the nation. From the link between smoking and cancer to curing a solid tumor with chemotherapy, The Damon Runyon Cancer Research Foundation is behind some of the most innovative cancer research. Since its founding in 1946, the Foundation has invested nearly $355 million and funded nearly 3,700 young scientists, including 12 Nobel Prize winners. Ms. Egan is responsible for maintaining and enhancing the excellence of the Foundation’s award programs; raising public awareness about the Foundation; and overseeing fundraising activities in partnership with its Board of Directors comprised of leaders in business, science and philanthropy. Have You Hugged a Scientist Today?